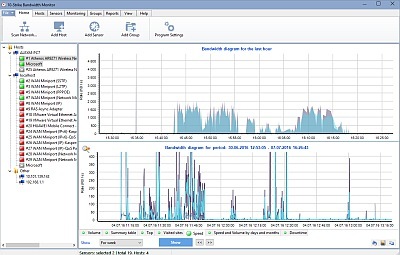 Monitor the Internet and local network traffic usage with 10-Strike Bandwidth Monitor. The program is designed for Microsoft Windows network administrators, IT specialists, ISP, and small businesses. With this award winning software, you can easily monitor the network bandwidth and the LAN/Internet traffic usage, discover the packet transfer speed on your computers, routers, switches, printers, etc. The program monitors your network bandwidth in the 24/7 mode. You can watch the network bandwidth charts in the real-time detecting the most active users or hosts, build the table reports on the downloaded traffic volume, and print reports (see examples on the screenshots page). Configure email or SMS alerts and the program will notify you when the bandwidth or the traffic volume (per interval - day, month, etc.) is exceeding or falling under the configured threshold on network hosts. This is useful when you have a monthly traffic limit or when you monitor your network hardware to avoid being overloaded. The traffic information can be gathered via SNMP, WMI, and agents. With WMI, you can start getting the traffic information from Windows PCs immediately without installing anything on remote computers. All you need is the domain administrator password. SNMP can be used for managed switches, routers, and *nix systems. You can also install our agent service on remote PCs if they do not support SNMP or WMI cannot be used for some reason. The agent installation file is provided with the program and can be installed remotely as the .msi package using Group Policy. * Find out who is locking your network downloading or uploading huge amounts of traffic. You can watch the real-time network bandwidth charts. Or you can be notified automatically about hosts or persons exceeding the traffic or bandwidth limits. An enormous Internet activity of your employees leads to their worse productivity (if this is not their duty). Analyze graphs and find persons spending a lot of the Internet traffic. You can also analyze addresses of web hosts your computers communicate with (only when using the "Sniffing packets" sensor type with our Agent). * Count the network or Internet traffic volume utilized by your computers. Compare values provided by our bandwidth monitoring program with your ISP bills. Analyze and plan the network load on your switches and routers to avoid overload and extend the network capacity in time. * Monitor the network bandwidth and be notified when the bandwidth is lower/higher than a configured limit. Configure alerts and get screen, sound, e-mail, and SMS notifications. The program will also alert you when network interfaces go down. * Check your network bandwidth. Find out what bandwidth was on your hosts at any moment. The program stores the traffic and bandwidth stats so you can check the history bandwidth charts and discover what happened. 1. 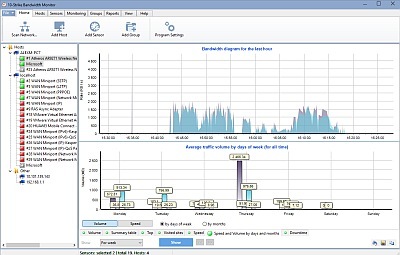 Monitor the network bandwidth and traffic volumes utilized by network users with our program. You can watch current network bandwidth charts for network hosts in the real-time or analyze the historical data which is saved to the internal database automatically. Thus, you can easily find out what user or device utilized the most of network traffic in the reporting period. 2. 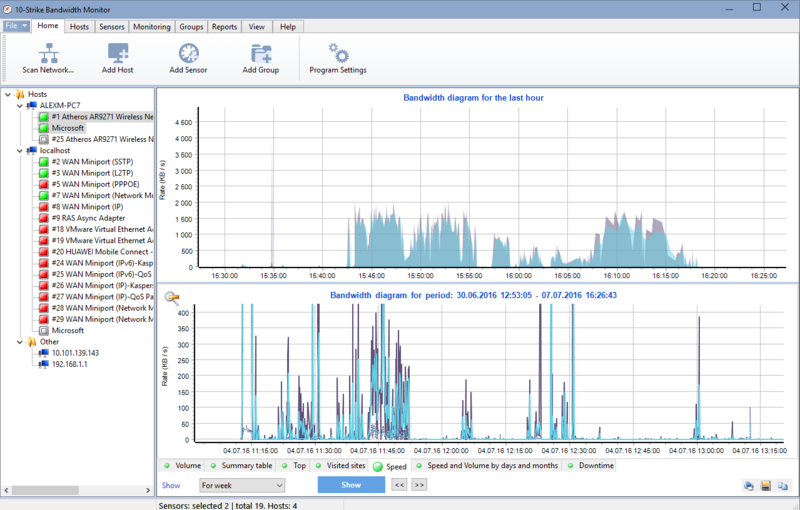 The program stores the traffic and bandwidth history for your network. 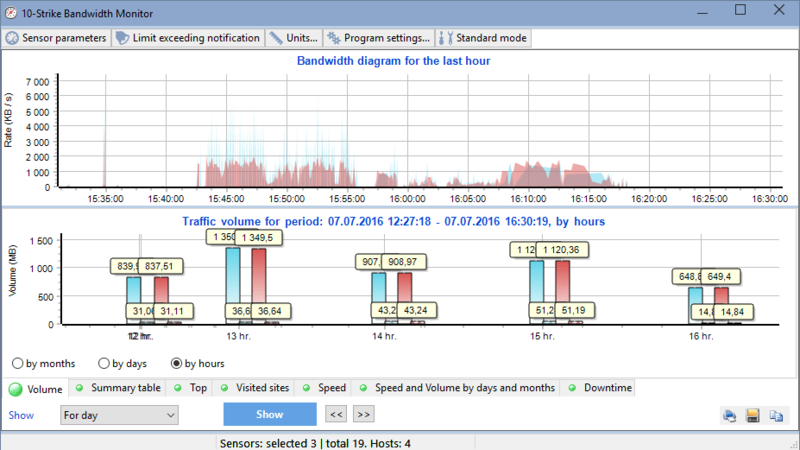 You can watch and analyze the network bandwidth charts for any date and time later. You can watch the daily, weekly, and monthly charts. 3. 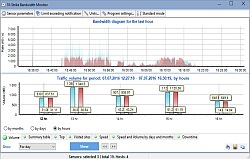 The bandwidth monitoring program is installed on the network administrator's computer only. It accesses the traffic and the bandwidth data from remote computers and hosts over the network. Remote agents (our client-server service that can be installed on any remote PC; it contains a sniffer for gathering network addresses the host is exchanging with). So, you can configure the program in multiple types of environment and monitor the traffic data on varous devices. recording to the system Event Log. 10-Strike Bandwidth Monitor 3.0 is a finalist for the 2015 Network Computing Awards. The program was nominated for the "IT Optimisation Product of The Year" Award category by "Network Computing UK" - a popular networking magazine in the Great Britan.